With Libya split between the British and the French, it fell to the United Nations to decide what to do about the country. In the meantime, both European powers ruled like colonial masters, working through local collaborators. The French relied on the Sayf al-Nasr clan in Fezzan, and the British used the Senussi order as their chief agents. 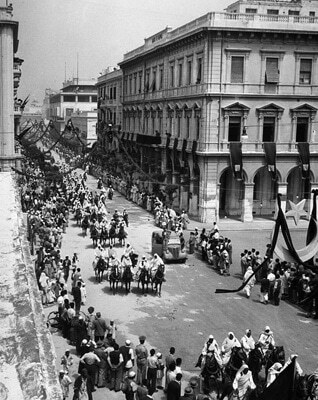 In Tripoli, public opinion among the elite favoured the creation of a united state, but the population of Cyrenaica would accept unity only under the Senussis. Any idea of splitting Libya permanently between the British and French was vetoed by the Soviet government because of the strategic advantage it would give the Western powers in the central Mediterranean, so the Security Council compromised on an independent federated Kingdom of Libya under Muhammad Idris. The British and American governments were allowed to maintain military bases on the coast. 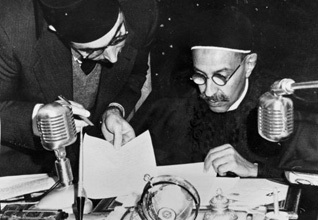 Libya became independent on 24 December 1951, but the new state had no resources, only a tiny local middle class, no developed economy, no trade, no jobs, 94 percent illiteracy, and a per capita annual income of USD 35. An estimated 11 million unexploded mines had been left behind on the battlefields of World War II. Libya was the poorest independent country on earth. It also had a dysfunctional political structure. 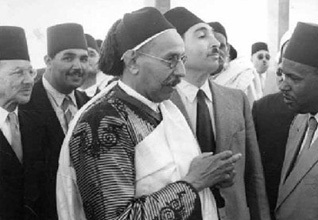 It was designated a constitutional monarchy, but the King – monarchy was a new concept for Libya – was appointed by the great powers of the United Nations. No Libyan was involved in the creation of the new state. To take account of the enormous difference in the political experiences of Tripoli, Cyrenaica, and Fezzan, each of the provinces had a great deal of autonomy and their own provincial councils. Although there was a national Parliament and a national government, there was no overall structure for managing the economy. In 1959 the central government employed only 1,200 people, but the provincial government in Tripoli had 6,000 civil servants and Cyrenaica’s had 4,000. Eventually there were two capitals: Tripoli and the Senussi hometown of Bayda in the highlands of Cyrenaica. As a result, the economy was directed by the monarchy with little control on how money was spent, causing rampant corruption. Not even the Armed Forces were integrated: local defence forces in Cyrenaica and Tripoli side-lined the national army.